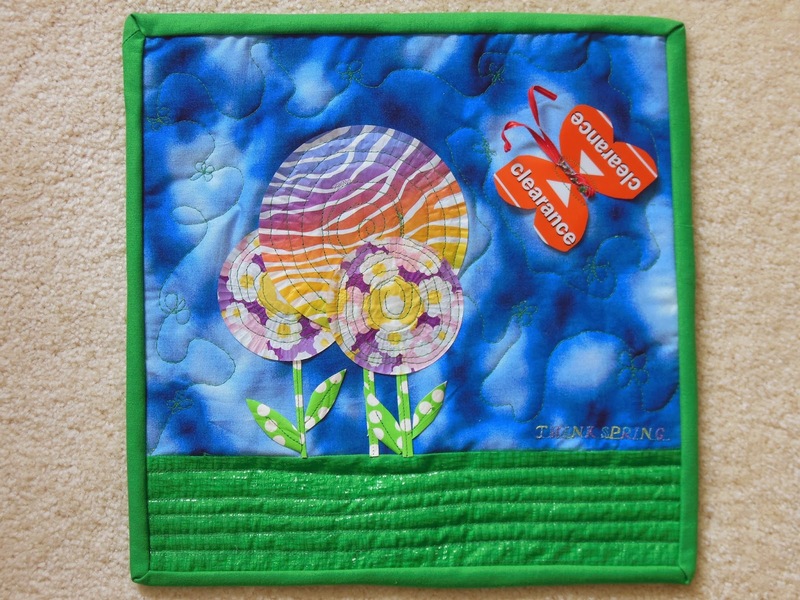 Our quilt challenges are back! It’s been a little while but Brenda, Candy, and I are back to business… the grocery business, that is 🙂 We decided to tackle an unconventional materials challenge, a la “Project Runway”. Our guidelines were simple: to use materials from the grocery part of the store (no straying over to any of the other departments in a store such as Meijer!) and a return to our familiar 12″x12″ format. Do you recognize any of the materials? 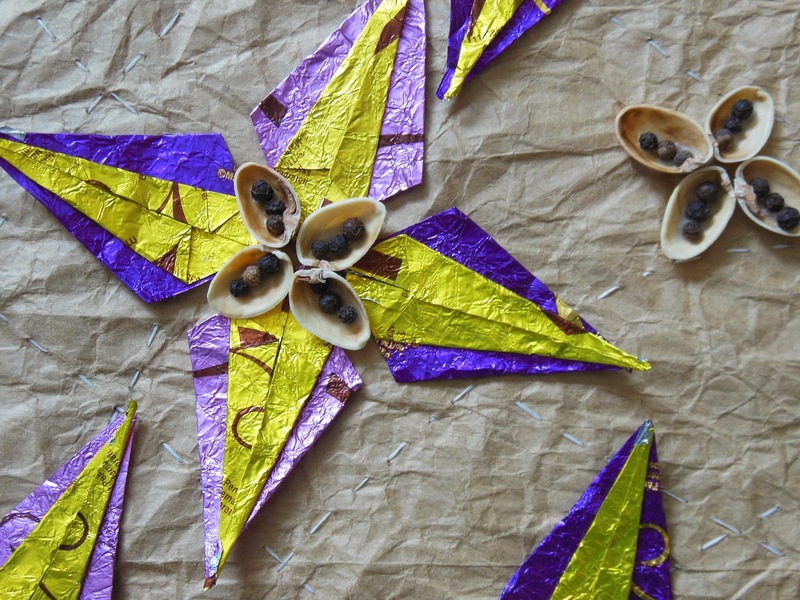 Dove candy wrappers are the basis for origami style stars that are then embellished with pistachio hulls and peppercorns. 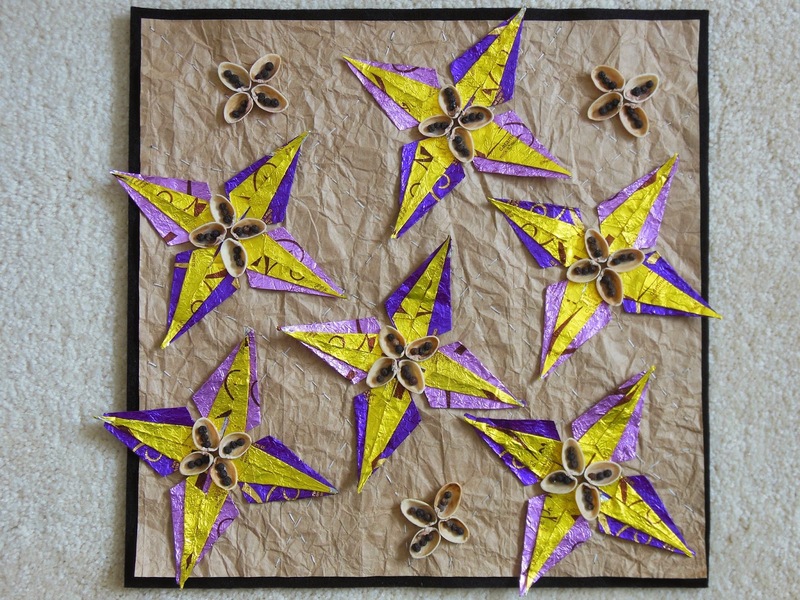 The background is a brown paper sack, softened and texturized by crumpling. And the stitches?… dental floss! Brenda started, scrapped, and restarted three times for this challenge. Candy wrappers were also in her original mix – as well as a Michigan State University spartan theme that came and went. 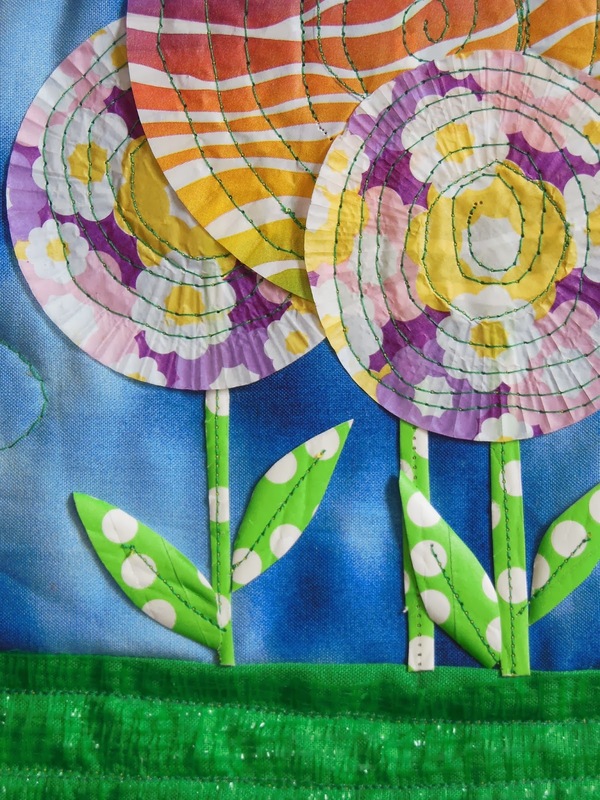 Ultimately with time running out she finished quilt #3, a spring themed confection. 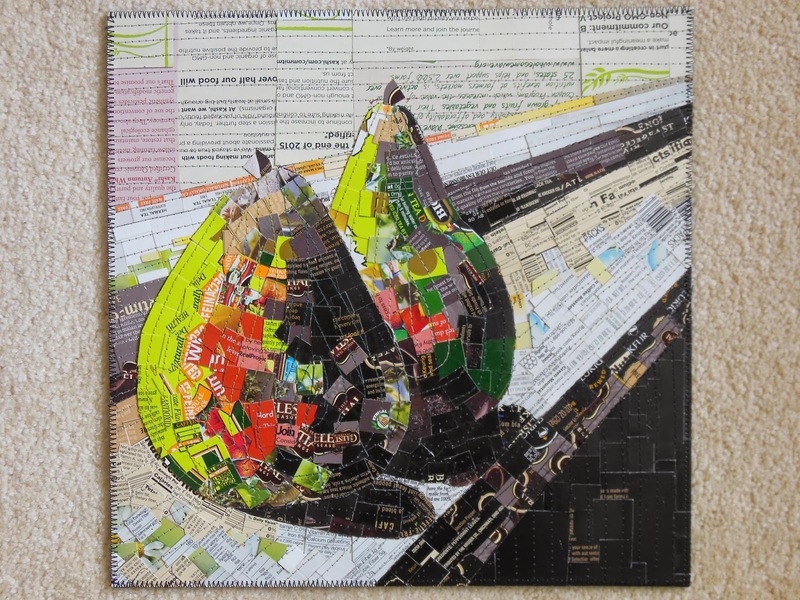 A photo of pears on my kitchen windowsill provided the inspiration for my quilt. 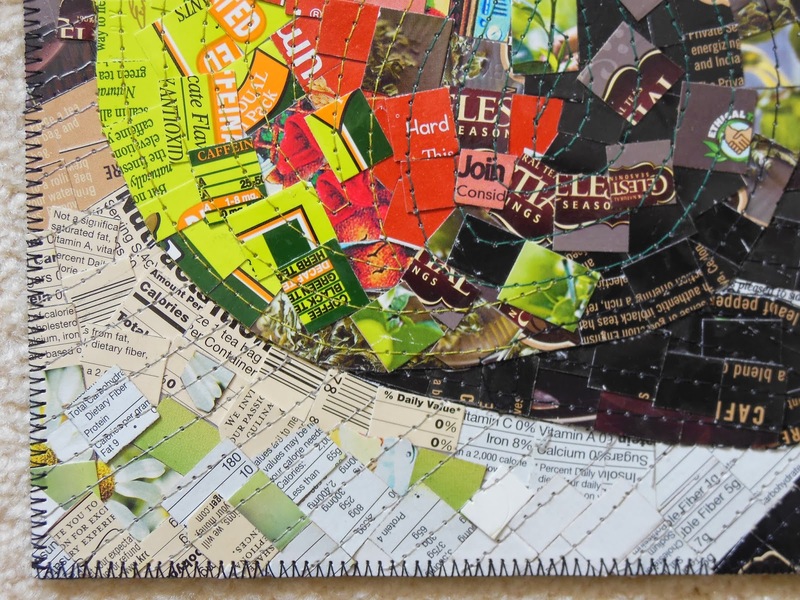 For materials I used the cardboard packaging from tea and cereal boxes. After gluing layers of cardboard to muslin pattern pieces that I then fused to another muslin base, I was fearful for any attempt at quilting. A first try on my old sewing machine failed so with trepidation I approached the “Queen”, my Janome Horizon. What a work horse! I ended up not only sewing the top image to the muslin base but added a very thin batting and backing and lightly quilted the whole thing 🙂 To finish, a zig-zag stitch around the edge pulled it all together. The grocery store challenge is complete and I think we’re all glad to move on from that project! The next time I watch Project Runway’s unconventional materials episode, I’ll definitely have a new appreciation for their workroom angst. Up next? It’s a Photo Opportunity Challenge. Catch our reveal in April!Here’s a link to Off The Wall Friday!